Peat-based soil-less growing media, ideal for use with drain-to-waste hydroponic gardening. 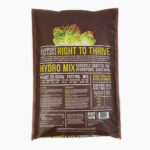 Ready-to-grow mix contains nutrients to support strong plant growth. Ideal for beginner hydro growers. Retains water and drains easily. Feed plants with Root Farm liquid nutrients within 30 days after planting. 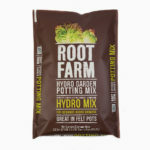 TO PLANT: Select the proper sized Root Farm Felt Garden Pot and fill partially with Root Farm Hydro Garden Potting Mix. Loosen the root ball of your plant and place it in the container. Fill until level with the top of the root ball. 1 bag fills 6 small felt pots, 2 medium felt pots, or 1 large felt pot. TO WATER: Water thoroughly until the pot is saturated and water drips from the bottom of the pot. TO FEED: Add Root Farm Base Nutrient (Part I) and a Root Farm Supplemental Nutrient (Part 2) within 30 days after planting for abundant harvests. Formulated by hydroponic gardening experts, with sphagnum peat moss, coco coir, aged softwood bark, perlite, worm castings, bat guano, feather meal, bone meal, blood meal, sulfate of potash, kelp meal, and volcanic ash.